This fun and economic 2 3/4" Tennis Wreath Medallion offers the quality of an antique gold, silver or bronze Qualicast medal at a price that can't be beat. This tennis multi color sport resins gives you a colorful and unique award. The award showcases tennis icons of a racket, tennis ball, and net. 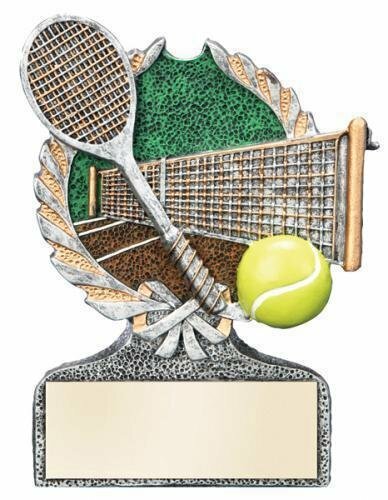 This full color award features the racket and net are in both gold and silver, the tennis ball is yellow and has white piping, a brown tennis court with white lines sits in the background and completes this award. A wreath with a bow at the bottom bring the entire award together. Standing 5" tall with plenty of room on the base for your engraving needs is sure to make this the perfect award for your next competition.